Three icy comets orbiting among the rocky asteroids in the main asteroid belt between Mars and Jupiter may hold clues to the origin of Earth's oceans. Three known main-belt comets are seen in the center of each panel) Other objects shown are stars and galaxies smeared by the motion of the telescope while tracking each comet. Images taken with the UH 2.2-meter telescope by H. Hsieh and D. Jewitt (Univ. Hawaii). The newly discovered group of comets, dubbed "main-belt comets" by University of Hawaii graduate student Henry Hsieh and Professor David Jewitt, has asteroid-like orbits and, unlike other comets, appears to have formed in the warm inner solar system inside the orbit of Jupiter rather than in the cold outer solar system beyond Neptune. The existence of these main-belt comets suggests that asteroids and comets are much more closely related than previously thought and supports the idea that icy objects from the main asteroid belt could be a major source of Earth's present-day water. This work is scheduled to appear in the March 23 edition of Science Express and in an April print edition of Science. The crucial observations were made on November 26, 2005, using the 8-meter Gemini North Telescope on Mauna Kea. Hsieh and Jewitt found that an object designated as Asteroid 118401 was ejecting dust like a comet. Together with a mysterious comet (designated 133P/Elst-Pizarro) known for almost a decade but still poorly understood, and another comet (designated P/2005 U1) discovered by the Spacewatch project in Arizona just a month earlier, "Asteroid" 118401 forms an entirely new class of comets. "The main-belt comets are unique in that they have flat, circular, asteroid-like orbits, and not the elongated, often tilted orbits characteristic of all other comets," said Hsieh. "At the same time, their cometary appearance makes them unlike all other previously observed asteroids. They do not fit neatly in either category." 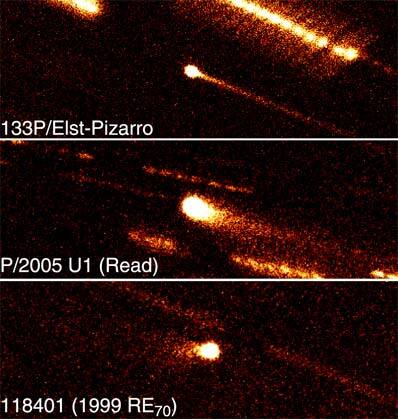 In both 1996 and 2002, the "original" main-belt comet, 133P/Elst-Pizarro (named after its two discoverers), was seen to exhibit a long dust tail typical of icy comets, despite having the flat, circular orbit typical of presumably dry, rocky asteroids. As the only main-belt object ever observed to take on a cometary appearance, however, 133P/Elst-Pizarro's true nature remained controversial. Until now. "The discovery of the other main-belt comets shows that 133P/Elst-Pizarro is not alone in the asteroid belt," Jewitt said. "Therefore, it is probably an ordinary (although icy) asteroid, and not a comet from the outer solar system that has somehow had its comet-like orbit transformed into an asteroid-like one. This means that other asteroids could have ice as well." Asteroidal ice may give a better match to Earth's water, but until now, any ice that the asteroids may have once contained was thought to either be long gone or so deeply buried inside large asteroids as to be inaccessible for further analysis. The discovery of main-belt comets means that this ice is not gone and is still accessible (right on the surfaces of at least some objects in the main belt, and at times, even venting into space). Spacecraft missions to the main-belt comets could provide new, more detailed information on their ice content and in turn give us new insight into the origin of the water, and ultimately life, on Earth. Comets also have large, elongated orbits and thus experience wide temperature variations. When a comet approaches the Sun, its ice heats up and sublimates (changes directly from ice to gas), venting gas and dust into space, giving rise to a tail and a distinctive fuzzy appearance. Far from the Sun, sublimation stops, and any remaining ice stays frozen until the comet's next pass close to the Sun. In contrast, objects in the asteroid belt have essentially circular orbits and are expected to be mostly baked dry of ice by their confinement to the inner solar system. Essentially, they should be just rocks. With the discovery of the main-belt comets, we now know this is not the case, and that, in general, the conventional definitions of comets and asteroids are in need of refinement.